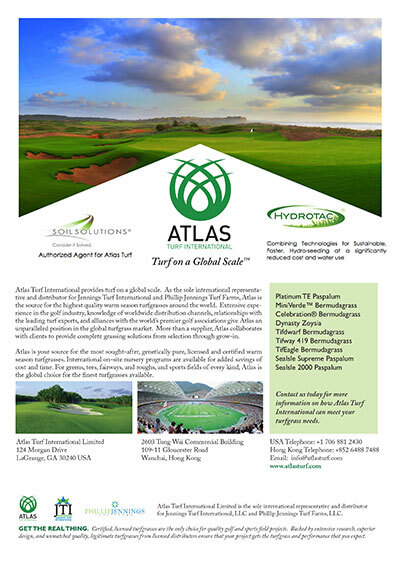 Effective Golf Course Hydro Seeding with one application! 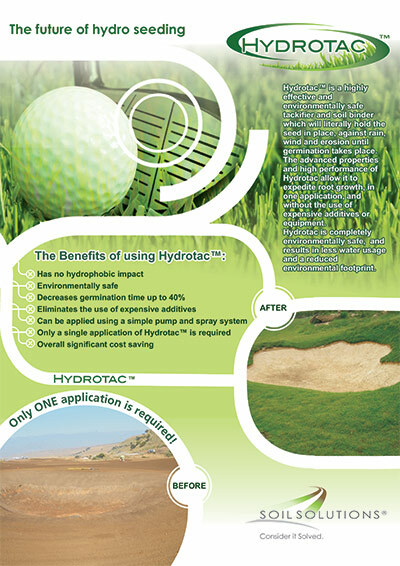 Hydrotac – the future of golf course hydro seeding! Golf course Hydro seeding has always been an important, time consuming and costly component of golf course development. Typically, hydro seeding will comprise of a number of different components including: Tackifier, Soil binder – Water retention additive – Fertilizer – Mulch – Cotton – Wood fibre and High Quality Grass seed but when using Hydrotac, ONLY grass seed is required! Hydrotac is an environmentally safe, specifically formulated highly effective tackifier. It is diluted with water which serves as a carrier agent and when applied to the ground, air and sunlight become the curing agents. Hydrotac™ is a tackifier and soil binder which in effect “glues” the hydro seed mixture to the surface of the ground until the germination and root growth occurs. The adhesive properties of Hydrotac allow it to literally hold the grass seed to the surface of the soil while allowing air and water to pass through it in to the ground facilitating the germination of the seed without allowing any negative hydrophobic impact. 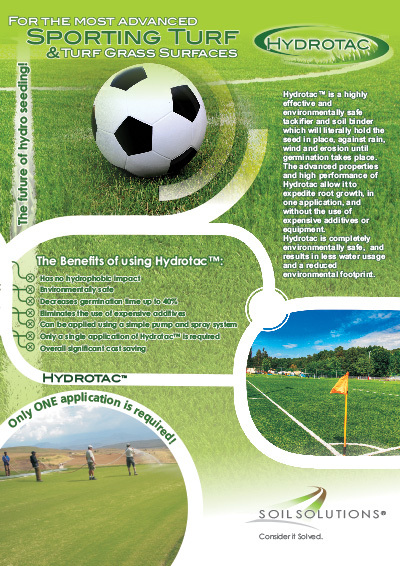 Hydrotac has the ability to penetrate the soil by holding the seed in place for germination. The application rate for hydro seeding is very light (.03-.10 Lires/m²) and will provide for a very light flexible crust which will allow the seed, mulch, fibre and cottons to be “tacked” to the soil – with just one application! Decreases Germination time — Yes, the seeds will germinate sooner! The most exciting and advantageous characteristics of Hydrotac™ includes its ability to effectively hydro seed without expensive additives and its ability to actually “Speed up” the germination process. This was demonstrated at Ernie Els Nondela Drakensberg Golf Estates in South Africa, where the germination of the Kentucky Blue Grass took place 2-3 days sooner than normal. Hydrotac is completely environmentally friendly, safe for animals, wildlife and vegetation and dries clear and transparent; leaving the environment in its natural state. Hydrotac meets all ISO 14001 requirements thus helping to keep all companies involved with the use of the product compliant. What makes Hydrotac a cost effective solution? The use of Hydrotac for hydro seeding only requires fertilizer and grass seed thus eliminating the need for costly additives such as organic supplements, wood fibre mulch, cotton mulch, hydro pam and stock absorb. In addition the adhesive properties of Hydrotac will hold the fertilizer and seed in place and will not wash away (even with heavy rains) therefore only requiring one application of the product. Hydrotac is applied using a simple pump and spray system that is easily housed on a trailer or in the back of a truck for ease of movement and access to any area. A common adjustable spray nozzle is used to ensure that the required application rate is adhered to. The product is applied over the area using 1 to 2 coats depending on the soil conditions. A Finn hydroseeding machine or equilvalent is not required. What is the recommended application rate for Hydrotac? The application rate for Hydrotac varies from .02 to .10 litres per square meter depending on soil conditions as well as desired effectiveness. What is the best ratio of Hydrotac to water to use? The best ratio to use is 1 part Hydrotac to 10-15 parts water (the Hydrotac is always added to the water) Again this depends on soil conditions. What affect does Hydrotac have on germination time? Are there any special requirements for storing Hydrotac? Why Hydrotac instead of other products or traditional methods of hydro seeding? design, and unmatched quality, legitimate turfgrasses from licensed distributors ensure that your project gets the turfgrass and performance that you expect. On-Course provides site assessments, and on site training to your current construction and maintenance teams. Let us know what your requirements are?